The origins of computer science at NCSU can be said to extend back to the basement of Patterson Hall when, in 1957, the Department of Experimental Statistics installed computers there... In 1965, an ad hoc committee on Computer Science was formed to include faculty member from the departments of Electrical Engineering, Mathematics, Economics, Industrial Engineering, Chemical Engineering, Statistics, and the director of the Computer Center, Paul E. Lewis from the Mathematics Department... 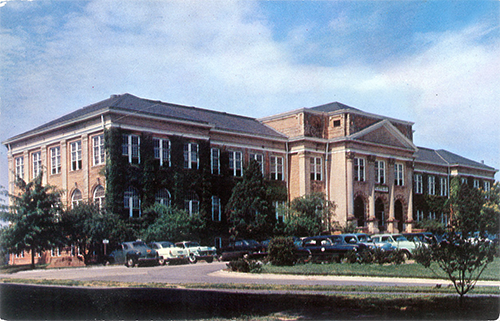 In February 1966, Paul E. Lewis and John W. Cell of the Department of Mathematics wrote the report for the Ad Hoc Committee, recommending the reconstitution of the Computing Center into the Department of Computer Science within the School of Physical Sciences and Applied Mathematics (later renamed Physical and Mathematical Sciences or PAMS). According to the plan, the Computer Science Department (CSC) would offer a Bachelor of Science with a core curricula made up largely of courses renamed and adapted from existing courses in Math, Engineering, and Statistics. The faculty also would reflect this disciplinary diversity, being drawn from the various departments just as the members of the Ad Hoc Committee had been... Instruction in the Computer Science Department began in Fall 1967 with 21 declared majors and 460 students. By Spring 1968, the number of majors had more than doubled to 49... The person in charge of the new department was Paul E. Lewis..."